Stacy Adams Shoes have been around a very long time. Stacy Adams Wingtips were quite popular to wear even back in the days of Prohibition in the 1920s where you had to sneak your drink. If the vintage styles of the Prohibition era compel you in a way that other styles simply don't, there are the 1920s style Stacy Adams wingtips called the Dayton. These Black and White 1920s style wingtip shoes feature Shiny Black Patent leather and White Smooth Leather Uppers with leather lining with a real vintage vibe. They are made in the same factory as the Stacy Adams Madison Shoes so you know they have that authentic vintage vibe. Here is where to buy outrageous Zoot Suits. If you're shopping online for either vintage 1920s style Black and White Wingtip shoes or Black and White Spectator shoes, you'll do yourself a real favor by getting yourself a pair of these Stacy Adams Wingtip Shoes called the Dayton. Since these shoes are made by Stacy Adams shoes , you know that they will look great and fit great and last. 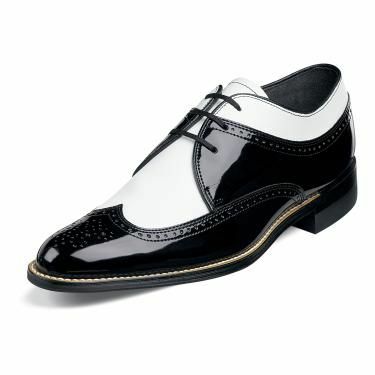 Black and White Wingtip Shoes have become very popular for Men that are into Zoot Suits or 1940s Swing Dancing as well Stage Productions as well. Stacy Adams has been making vintage style shoes that go on the feet of style minded men for generation after generation. By making consistent fitting dress shoes that look good and fit good on your feet, confidence is quickly gained once you start wearing Stacy Adams wingtips. Once you make that initial step in buying your first pair of Stacy Adams wingtip shoes, it won't be long until you Stacy Adams becomes the go to brand of stylish wingtip shoes again and again. That how hard they strive to maintain your business year after year. Questions you may have about Stacy Adams Shoes. Question: Do Stacy Adams shoes run to size? Answer: Stacy Adams shoes goes to great lengths to make sure that all of shoes they produce run to the same exact size as the next pair of Stacy Adams. They are built on shoe lasts or forms that run to a standard dress shoe size primarily in a D width although they do make some of their shoes in a wide width as well. If you wear a size 10.5 sneaker from Reebok or Nike, you would need to order a size 9.5 online. Stacy Adams goes to extreme lengths to ensure that their shoes will fit your feet right and be comfortable so you buy them again and again. They haven't been been business for over a hundred years for nothing. Question: Are Stacy Adams Shoes made of leather? Answer: You can shop online with complete confidence that all of the Shoes made by Stacy Adams are made of full leather uppers made of either calfskin leather or cowhide leathers that are printed to look like crocodile skin or ostrich skin at an affordable price. Many of the dress shoes that Stacy Adams makes also have full leather soles as well which are long lasting and ensure that you'll be able to wear them season after season and give you the style and comfort that you were looking for. If you didn't know already, you are always better off buying dress shoes or any shoes for that matter that are made of leather because genuine leather has the ability to breathe and absorb moisture away from your feet. If the shoes are not made of leather, they are usually made of a synthetic leather which is made of some sort of vinyl that can not breath or absorb your foot sweat in any way shape or form. Plus leather is very durable as well and lasts because leather is able to flex again and again without cracking during use unlike a pair of synthetic upper shoes that you will see starting to crack after several uses. Question: How can I get the most use out of my Stacy Adams Shoes? Answer: The thing that any man needs to know about being well dressed is to always take care of suits and shoes that they own. Keep your suits clean and pressed and keep your shoes clean and polished. With Stacy Adams shoes like any other dress shoes you own, you need to keep them clean and shiny. When you're done wearing them for the day, wipe them off with a damp rag if they have become soiled through out the day. Then if you really want your shoes to last, get yourself some cedar shoe trees and put them in your shoes to put the shoes back in their original shape. The cedar shoe trees also have the added benefit of making your shoes smell good and they do something really important. They absorb all of the moisture from the leather that your feet were giving off during the day which will ensure that your shoes will last longer because the salts in your sweat can start to break down the leather after awhile. Cedar shoe trees should be a welcome addition to any well dressed man's arsenal for maintaining his shoes. Question: Is there any kind of special shoe polish I should use for Stacy Adams shoes? Answer: I always recommend using shoe wax polish like Kiwi that comes in most of your basic shoe colors over shoe creams because a wax based polish will provide better protection for the leather of your Stacy Adams shoes or any leather shoes for that matter than a cream polish. Plus a wax based shoe polish provides a much better shine for your shoes as well than a cream polish can provide. It also is quicker to use than cream polish because when you use a cream polish you have to let the polish dry because it is usually wet right out of the jar but with wax based polish you only have to let it sit a minute before you start to buff them out to fine shine.